It’s Friday evening…After pulling thru’ the 5 long weekdays, it’s finally here. Chilled Beer (lemonade for kids) & an evening out with friends in a local pizzeria is one option, the other one being having a quiet family time with a pizza home delivery. So one of these Fridays we opted on having that Oh! so precious (Quiet? no way!) family time & some thought of “custom pizza”. I put the beer cans in the refrigerator, hubby goes up to pick a movie which we hope we can all enjoy together (mind it we have kids), & I pick up the phone and dial the number while I fish out the Pizza Coupon… here starts the drama-If you are like us ( “Picky Pizza People”) you would know what I am talking about. I say it out loud & clear. On the cheesy half, I will have half kept with no toppings & the other half will be veggie…& on the less cheese part, we will have veggie with the Jalapeno on only the half of it…. “Would you please hold for a second?” [ by this time the lady on the other side must be ready to quit her job dealing with freaks like me on a Friday evening]. she dumps my order! Now the manager is one the phone..
& I START ALL OVER AGAIN…. 25 minutes on the phone, 3 frustrated people & finally the order is done. 40 mintues later the beer cans are getting there, the movie has been decided on, it’s past dinner time for the kids, the bell finally rings, we run to the door…get the pizza, open it & Walllaaaaaaa every darn thing is in the wrong place. The evening aside, I have been wanting to make pizza from scratch for a long time now. First comes the baking thrill, then the satisfaction of “yes i did it!”, then of course u can make the desired size with the desired toppings, all demands fulfilled. But this time, the first time I made this Margherita Pizza with Fresh Basil & Tomatoes. The recipe i followed as is from Food & Wine was indeed a perfect pizza – This time for a perfect evening for even the “Picky Pizza People”. “The popular pizza Margherita owes its name to Italy’s Queen Margherita who in 1889 visited the Pizzeria Brandi in Naples. The Pizzaioli (pizza maker) on duty that day, Rafaele Esposito created a pizza for the Queen that contained the three colors of the new Italian flag. The red of tomato, white of the mozzarella and fresh green basil was a hit with the Queen and the rest of the world. Neapolitan style pizza had now spread throughout Italy and each region started designing their own versions based on the Italian culinary rule of fresh, local ingredients.” ( source: internet article from Life In Italy..) Sending this to Homemade #2- Breads. 32 basil leaves torn in pieces. In a large bowl mix the yeast with 1/2 cup of warm water & sugar & let it stand until foamy, about 5 minutes. Add remaining 1 1/2 cups of warm water, the 4 cups of flour and the kosher salt and stir until a soft dough forms. Turn the dough out onto a well-floured work surface and knead, adding flour as necessary until a silky, but soft dough forms. Use a pastry scraper to help knead the dough. Transfer the dough to a lightly oiled bowl and brush all over with olive oil. Cover the bowl with plastic wrap and refrigerate overnight or for up to 3 days. Pass the tomatoes through a food mill set over a medium bowl or pulse them in a food processor until coarsely chopped. Stir in the oregano and 1 tablespoon of the olive oil and season generously with salt and pepper. Brush the top of the dough some olive oil. Sprinkle some flour over the oil. This will prevent the dough from getting soggy. Spread 1/4 cup of the tomato sauce over the dough to within 1 inch of the edge. 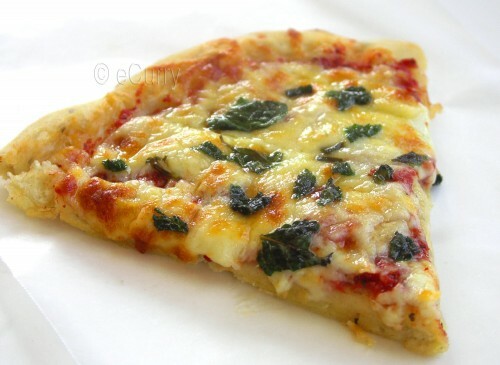 Spread one-fourth of the cheese over the pizza and drizzle with 1 tablespoon of oil. Season with sea salt and pepper and slide the pizza onto the stone. Bake until the bottom is charred and the cheese is melted, about 8-12 minutes. Scatter one-fourth of the basil on top and let stand for 3 minutes before serving. Repeat with the remaining dough and toppings. All I can say is, we did have a great evening this time, with a perfectly yummilicious pizza & four happy souls! Really it was good. You know.. nothing ever beats the taste of a warm bread or pizza coming to your plate straight baked from the oven – Simple, Delicate, Fresh herbs, lovely crust! I am taking my pizza over to the Festa Italiana held by Maryann of Finding La Dolce Vita & Maria of Proud Italian Cook. What an eventful evening! Home made pizza rocks..this looks great. No delivery pizza would look that attractive 🙂 I was a little confused there reading the conversation. Just lovely I can imagine the thrill the kids must have felt. Just how I love…the pizza is singing to me!!! 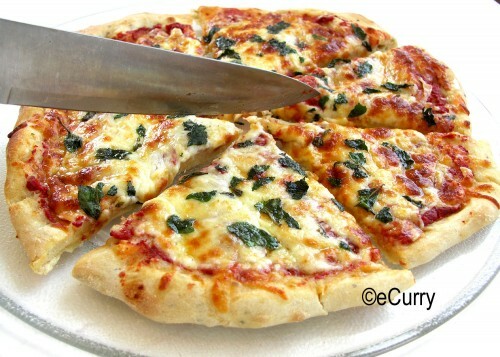 It’s the best, simplest, tastiest pizza…long live the Margherita! 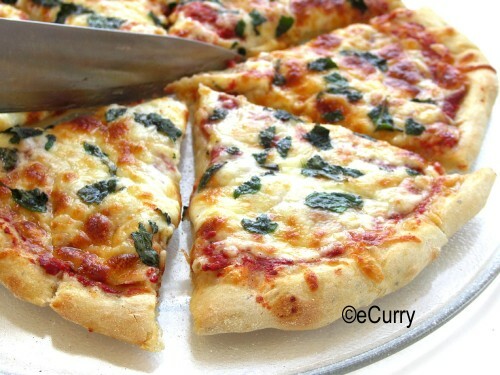 I do make pizza … but never the crust. Any particular reason why you use kosher salt? Sharmila, I think u can use any salt:-) ami ei prothom base tao barite korlam, recipe te chilo ar amar bariteo chilo, tai I used it here. nice post soma…hope ur margherita pizza suffices the need of all four distinct souls!! love your pizza…do you do home delivery? this is the best. soeren always orders this at our fave italian place and am always amazed how great a few ingredients can taste. this looks simply lovely! Wow they look perfect and so yumm. Lol lol…great evening…but those are great to remember SOma…And what a splendid click yaar.. Thanks for joining us at our festa! The pizza looks soo delicious Soma. Home made is definitely the best. I like mine with paneer, baby corn, olives, tomato and capsicum, no one can ever make that for me :)) I’ve tried weirder combo’s too, and ooh, some rosemary & red pepper flakes in the dough 😀 Where did you get the pizza stone ? I had some left over dough ( the recipe was enough for 4 large pizzas) & i added some oregano & rosemary to the dough & kneaded it again:-) .. then went really easy on cheese & sauce & topped it with only lots of veggies. it was great! like a grilled bruschetta. I still don’t have the pizza stone, I used the baking tray just like last time.. I copied the recipe from the original. that said pizza stone. i forgot to mention that i didn’t use one. i don’t order pizza from chains ‘cos when i say ‘no cheese’ they look a me funny. homemade pizza is best. Soma, My favorite kind of pizza! You’re making me hungry just looking at it! Thanks so much for joining us at the festa, I’m sure this will fly off the table! I had a smile on my face reading your experience with the pizza delivery. Sometimes though, the otherside perceives it as complicated, when in fact, it is not. But confusion happens. By the way, I really like the way your homemade pizza looks. We don’t eat much pizza, but I am tending to make more homemade pizza instead of the greasy kind we get at pizza shops. Aww what a mess after all of that time on the phone. But I think your pizza would beat any store made pizza! Isn’t it funny how the most easygoing people somehow always like their pizza just so? I went through something very similar with my friends. I love Margheritas 🙂 Simpicity rocks! It looks more than perfect. Rrrrrrrrrrrrrrrring, please can I order one Large 🙂 ? that was funny to read! Nice post.. That margherita pizza looks simply fantastic, Soma! So much for customized pizza order,I bet its much easier and tastier to make it from scratch,looks perfect! that’s a pizza baked to perfection. can i come over? i love pizzas…..
if u ever start a pizza joint, i will order from u, every time. That’s definitely a perfect pizza, Soma. It looks awesome. You are really good in the photography department. looks awesome, wonderful pictures! I loved reading your story. We haven’t ordered a pizza in along time now as we make it at home. I am a veggie freak and always want lots of veggies on my pizza, but you are really tempting me to try Pizza margharita. Sunny boy would love it, I’m sure. That’s the prettiest pizza I’ve seen in a long, long time! I will order one to go please! Very eventful//am glad there are more people like my family. I just started out with my very own pizza blog and I was looking for other blogs pursuing the same interest, although I know that my niche is very limited in the amount of blogs. Anyways, good job and keep it up. This has got to be one of the best pizza stories I have ever read…great. Poor poor pizza person who had to answer the phone. Just image if everyone ordered really complex pizzas with different toppings…it would be mayhem….and no one at home would ever get a pizza delivered….absolutely great. This looks fantastic. Margherita Pizza is on our menu for the next week. I’ll give this recipe a try. Thanks! Christ, lady. You put two pounds of cheese on a pizza? My favorite kind of pizza! You’re making me hungry just looking at it! Thanks so much for joining us at the party, I’m sure this will fly off the table! We made this for our anniversary.. wife & me both v. happy thanks!! Sorry for my late response.. but Happy Anniversary! Glad that you enjoyed. now i think i dont want to spend more money on pizza. i can prepare at home .its my favorite dish. thanks a lot for posting sucha simple and delicious dish. why does the dough have to rise so long? wont it waste of beer because it has over risen? If you are refrigerating the dough, the rate of rise is slowed down, so the dough will work just fine. I have been using this recipe for a few years now. If you do not want to do overnight, allow it to rest at room temperature for about hours, knead and allow it rise for the second rise again.